Even if you have a 9-5 job, looking for other ways to earn money is a great idea. Think of the money that you can save aside from your day job. It can be used to pay off debt, bills, and can make a big difference to your savings as well. And whether you’re looking for a part-time or full-time side hustle, there are plenty of opportunities. Here are some of the best side hustle ideas that can let you earn $1000 and more. These are job ideas that you can do on your own schedule and in the comfort of your home. As many of you know, our full-time job as bloggers started as a side hustle. And now it gives us so much freedom in finances, time, and location. And if you’re good at writing or sharing ideas, why not start your own blog? It’s easy to do, fun, and an amazing way to make extra cash while at home. It can give you so many opportunities if you’re willing to put in the work. For more tips and advice on blogging, check out my post on how I made $19,889.04 in just one month of blogging! The top rated affiliate marketing software, Click funnel is designed to help digital marketers have an effective online campaign. But this isn’t limited only to professionals, you can also consider this as a side hustle while working at home. Once you’ve signed up as an affiliate, Click Funnels will pay you a commission on the sales of the product that you’ve promoted. They pay a good amount that can be used for groceries, bills payment, and more. And if you’re at all interested in online marketing, then I highly suggest you sign up for their training called the Affiliate Bootcamp. If you have the skills and ability to connect with someone, consider a coaching business. This side hustle isn’t highly regulated and can be done from home whether through phone or computer. You can coach an individual or a group and potentially make a great income. It’s a rewarding side hustle that allows you to make a difference in others’ lives. Aside from starting up a blog, if you really love to write, why not be a freelance writer? There are plenty of sites that are in need of writing services and pay a good amount of money. All you need is a good internet connection and a computer! Negotiate your service price and in a few months you can possibly earn thousands a month. One of the best sites to sell your merchandise is on the Amazon. With its great online traffic, you can earn $1000’s a month easy. All you have to do is apply for an invite to the Merch by Amazon platform. Once you received your invitation (this usually takes two weeks up to six months), you can choose a product type, set your price, and write your product description. If you’re good in social media, graphic design, websites, email marketing, reporting, or other related tasks, you might want to consider to being a Virtual Assistant. All you have to do is fulfill your clients needs and help them. Check my post on how to become a virtual assistant! If you love working at home and you’re good at writing, you can find Proofreading opportunities to make extra cash in your spare time. The more content you can edit, the more monthly income you can add to your savings. For more tips and advice on proofreading, check out my post on how a Mom made $1,100 in her first month of proofreading! Whether you have an extra room or you’re going to be gone for a month, why not rent out your house while you’re not using it? Register your home on Airbnb and set the availability and house rules for your listing. Once your listing goes live, guests can book their stay at your home and you can start earning money. Seriously, the beauty of side hustle ideas is that you can do them anytime and anywhere. 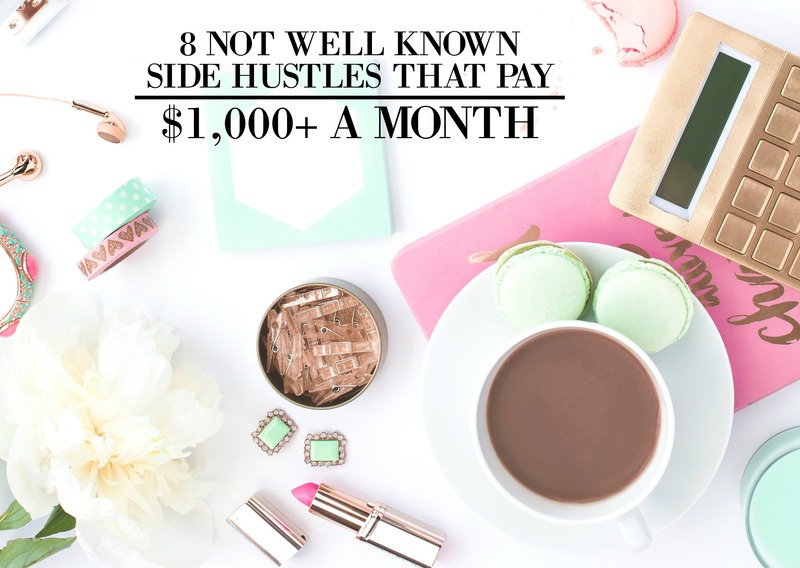 And the idea that you can earn thousands a month with these ten side hustles above is a total win. So choose any of them, try them out and let me know what you think. Now if you have any other side hustle ideas or ways to bring in some easy money, let me know in the comment below! I’d love to hear about them!